A Library War in Philadelphia? I'm All For It! Philadelphia's school budget woes have shuttered the district's much-lauded libraries. It's a failure of basic civilization that cannot be allowed to stand. 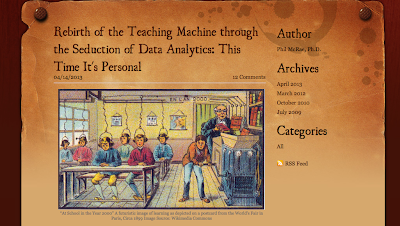 Rebirth of the Teaching Machine Through the Seduction of Data Analytics: This Time It's Personal. 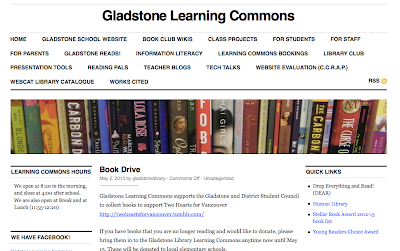 If the ALA is moving forward with a focus on school libraries, can the CLA be far behind? 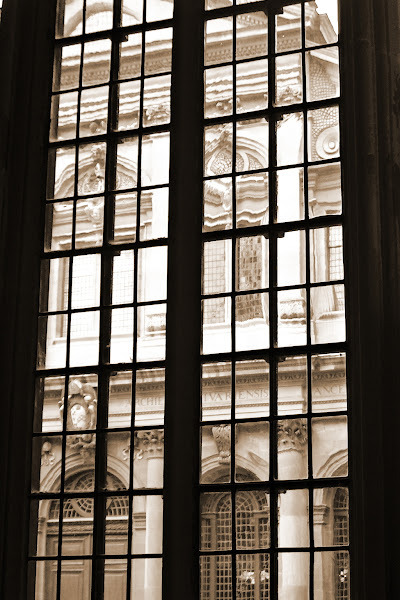 "As we are all aware, school libraries across the country are at a critical point. On the one hand, budget and testing pressures on administrators and school districts have led to decisions to eliminate or de-professionalize school libraries. On the other hand, the increased emphasis on preparing all students to be college and career ready and the widespread adoption of [new curricula] and integration of technology have opened an unprecedented door to school library leadership." Library World is becoming stranger and stranger. Everyone, it seems, knows better how to do the work of a librarian, though I have always believed the librarian's credentials are particularly difficult and rigorous. One simply has to shake one's head and heave sighs of relief these things only happen elsewhere! We heard about the "witch hunts" and trials of TLs in the Los Angeles Unified School District (LAUSD), a school district intent on determining whether or not TLs' have any qualifications to teach, their careers hanging on their success in these "kangaroo courts." And did you read my May 9 posting from Jamie McKenzie, the one appropriately entitled, "Jamie McKenzie and the Apocalypse"? Can it get stranger? Dude, Where's My Teacher Librarian? 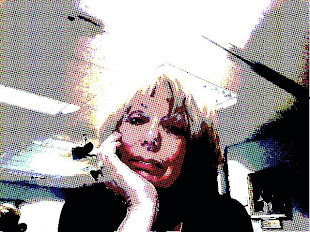 Editorial/blog from You Don't Know Spitt, by Steve Spitt (June 2013): Spitt comments -- and invites comments on -- the strange case of the replacement of District TL Janice Reynolds in the Near North School District (Ontario) with a District Principal of Library, Literacy, and Math (PLLM). That should do it! Hmmm! Is Agassiz beyond Hope?!! This is certainly beyond anything imaginable in my iteration of Library World. But my search also brought me ultimately to Donalyn Miller in Texas, a classroom teacher who had a gift for bringing even the most reluctant reader into the reading world. A recognized leader in Literacy, Donalyn -- The Book Whisperer -- eschews Lexiles, she challenges a guest blogger to connect the Kardashians to reading (he suggests that, in re-branding themselves, despite their underwhelming realities, they offer a model that works for reading re-branding), and she is clearly a follower, like me, of Dr Stephen Krashen. The Book Whisperer does Literacy in her classroom in terms I clearly understand and wholly endorse. Check out: The Book Whisperer. Speaking of Stephen Krashen, guess who is our Keynote Speaker for the BCTLA Summer Institute on August 27 at Hamber Secondary School? You guessed it! Stephen Krashen himself. Hope to see you there. Check out the event here: BCTLA Summer Institute Information and Registration. Annie Murphy Paul in Mind/Shift, 2013 June 3. Holly Kolby in Mind/Shift, 2013 May 31. SLJ’s 2013 Job Satisfaction Survey | What’s Not to Love? By Laura Girmscheid, School library Journal , May 6, 2013.
Who is this guy, and which of us would ever have imagined the incredible possibilities in this short video? Canadian Commander Chris Hadfield in a "tin can far above the world ... with nothing left to do" launches his brilliant cover of David Bowie's Sixties hit song. Tons of possibilities for student inquiry here. We in Vancouver schools will be wishing Chris the best of luck in coming down to earth after an epic journey of great interest to 1000s of students in Canadian classrooms. Way to go, Gladstone TLs Pat and Hilary and students. Love it!